Windsor Castle is exactly what you expect a castle to look like with a round tower, a moat (well dry moat), and castle walls up on a hill. It is the oldest and largest castle still in use in the world, built in the 11th century. The Queen spends most of her weekends here and hosts many important guests. I had seen the castle before from a distance but didn’t realize that you could actually visit inside. Well as impressive as the outside view of Windsor is, the inside is even more spectacular. Besides the immaculate decor, the artwork you will see is similar to what you would find at a top museum. 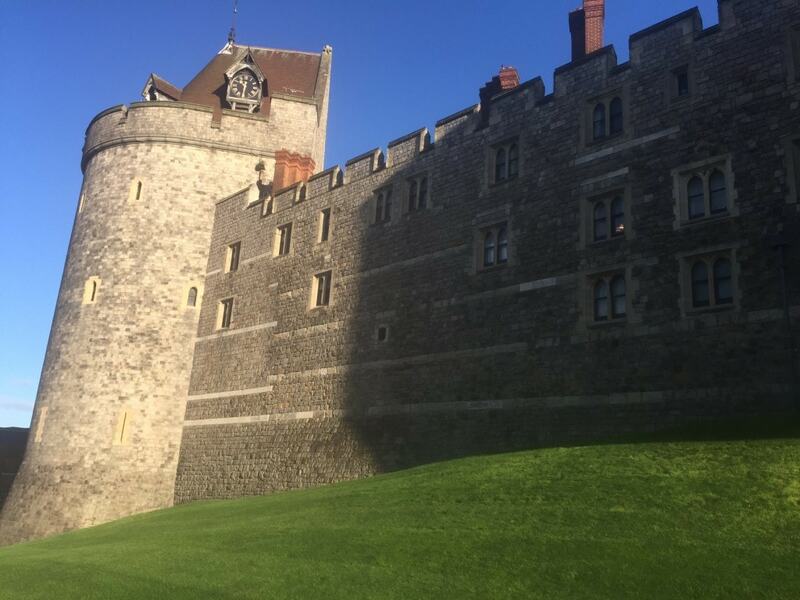 It is definitely worth doing a Windsor Castle day trip or taking a Windsor Castle tour from London! Since we were coming from Suffolk, we drove, parked and then walked to the castle. The cheapest parking options are on Datchet Road (Romney Lock and King Edward VII Car Parks) and on Alma Road (Alexandra Gardens Car Park). You can choose any of those three as they are all about a 10-minute walk to the city center and castle. If you can, try to get there for Windsor Castle changing of the guard ceremony that occurs at 11:00 am each day. You will probably need 3-4 hours to see the castle. Also, I would recommend buying your ticket in advance to avoid waiting in a long line to get in. If you get your ticket stamped and sign it before you leave, you will get a free year-long pass to visit the castle. I love the architecture of the castle. The outer wall of Windsor Castle. If you prefer, there are many tours to Windsor Castle that include transportation from London and your Windsor castle admission. (Check out this half-day tour through GetYourGuide.) 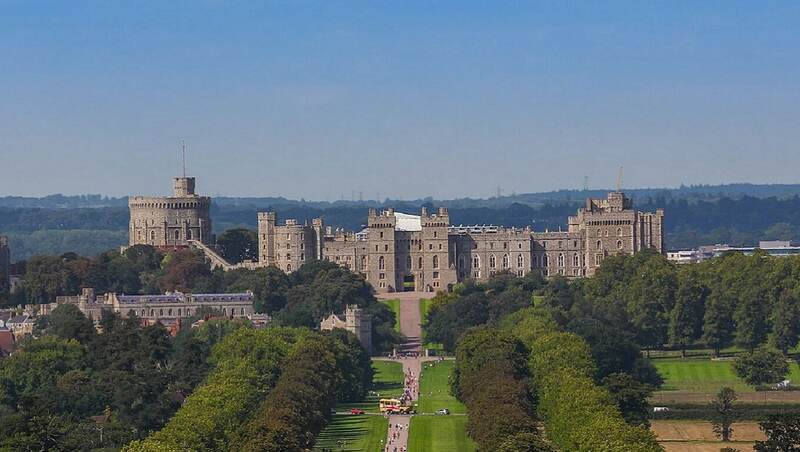 You could also do a tour that combines Windsor Castle with other attractions like Stonehenge, Bath, or Oxford. Keep in mind, that is a lot to see in one day and you would only get to scratch the surface of the places that you visit. The view just inside King George IV Gate. After going through security, pick up your audio guide, included in the price of your admission. 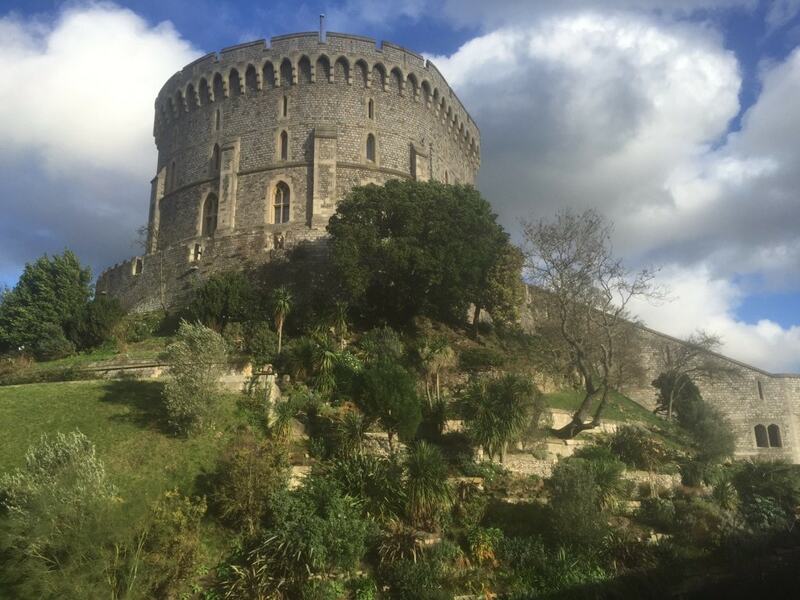 The self- guided audio tour provides a lot of information about Windsor castle and its history, broken down into short episodes. One big theme you will hear about throughout the tour is the devastating fire that caused £37 million of damage to the castle. If you didn’t hear about the fire, you would never know it happened because they did such an amazing job on the restoration. First, you will explore the outdoor areas of Windsor castle. 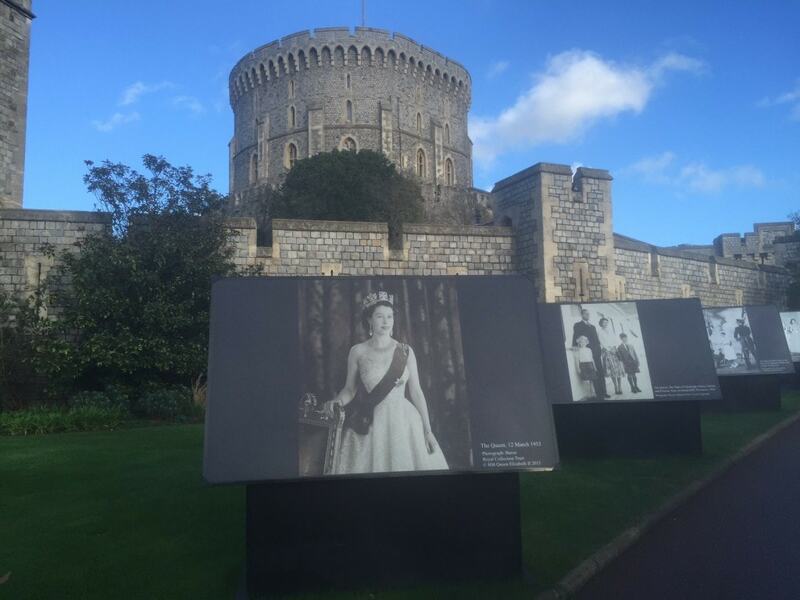 There was a nice display of photos of the royal family as you walk the grounds of Windsor Castle towards the King George IV Gate. It is hard to believe the Queen turned 90 with all of the stuff that she does, but then you see the old photos. The landscaping around Windsor castle is lovely. We were there in December and the grass was so green. Daffodils had bloomed – confused by the unseasonably warm winter. The Windsor Castle moat around the round tower, which has always been dry, has been turned into a garden. As you walk towards the entrance to Queen Mary’s Dollhouse and the State Apartments, be sure to admire the view of the countryside. The location on top of the hill was part of the castle’s defenses, any potential attackers would be spotted well before they reached the castle. I enjoyed the old portraits on display in Windsor Castle. I love the garden that they created in the moat of the round tower. 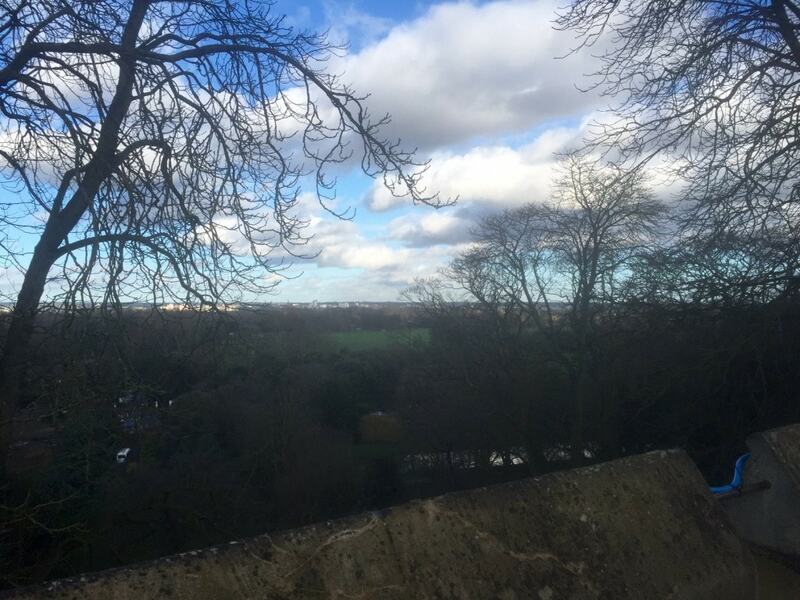 Beautiful view of the countryside from Windsor Castle. Next you can visit the inside of the castle, but unfortunately, you are not allowed to take any pictures inside. There was a bit of a line to see Queen Mary’s dollhouse, but it moved fast so don’t let it deter you. This is a dollhouse like no other and it was never intended to be a child’s toy. First of all, it is huge! Second of all, the detail inside is amazing. The dollhouse has running water and electricity and even includes a room with a replica of the crown jewels. After visiting the dollhouse, you should head towards the State Apartments. When you first enter, there is a space for temporary exhibits. When we visited, it was about Waterloo. The next room holds a very impressive collection of china. Then you enter the main part of the Windsor Castle State Apartments. Each castle room has its own story and its own purpose. It is decorated just like you would expect a castle would be – lots of gold and other ornate details. You will see artwork from Peter Paul Rubens, Sir Thomas Lawrence, and Sir Anthony Van Dyke to name a few. The Windsor Castle paintings collections was quite impressive. Some of my favorite rooms in Windsor Castle were the Waterloo Chamber, Crimson Drawing Room, Grand Reception Room, and St. George’s Hall. State Banquets are held in St. George’s Hall at a table that can hold up to 160 guests. St. George’s Hall sustained significant damage during the fire, but they did a great job restoring it. They had to totally redo the roof but still kept very true to the spirit of the original design. Finally, you will visit St. George’s Chapel, the church inside Windsor Castle completed in 1484, where Prince Harry and Meghan Markle got married in May 2018. It wasn’t the first Royal Wedding in St. George’s Chapel. Prince Charles and Camilla were also married inside. The roof and stained glass are spectacular, but again photography is not allowed inside this Windsor church. In addition to being a church with daily services, 10 monarchs are buried here, including Henry VIII, King George VI, and the Queen Mother. You will find Henry VII’s grave in the St. George’s Chapel Quire. I was surprised that it wasn’t anything fancy. The most moving part of the St. George’s Chapel was the memorial to King George IV’s daughter Princess Charlotte who died in childbirth at the age of 21. The memorial is stunning, all white marble, and so moving because one of the angels is carrying Princess Charlotte’s stillborn son. Meghan Markle’s beautiful wedding dress will be on display along with an identical version of Prince Harry’s frockcoat uniform of the Household Cavalry. The dress was designed by Clare Waight Keller, the British artistic director of the French fashion house Givenchy. The exhibition, A Royal Wedding: The Duke and Duchess of Sussex, will be at Windsor Castle from October 26, 2018, to January 6, 2019. Due to popular demand, the exhibition has been extended to February 17, 2019. 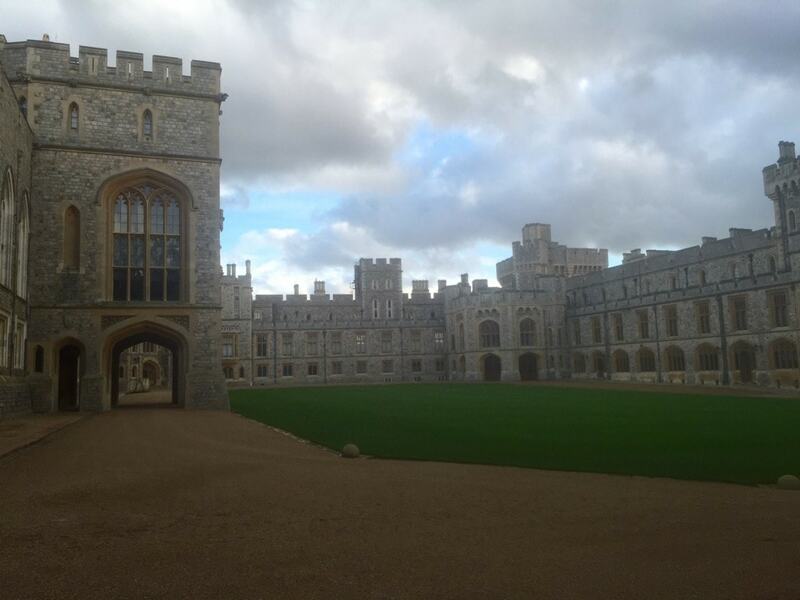 If you get a chance, I highly recommend visiting Windsor Castle. The audio tour was very interesting and I learned a lot! I’m not sure if there is another place that can match the architecture, history, and collection of priceless art and artifacts. I can understand why this place is so special to the Queen. I just wish I would have been able to take photos inside Windsor Castle. 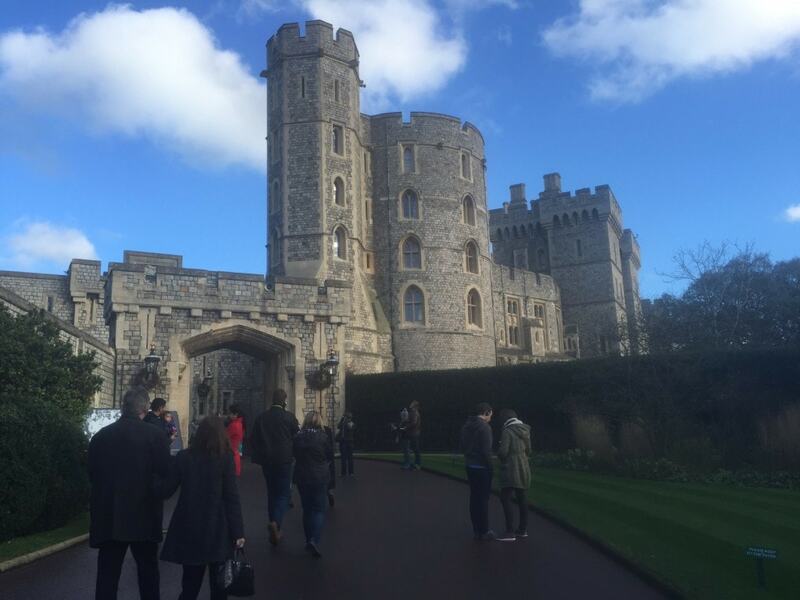 Have you visited Windsor Castle? I would love to hear about your experience. 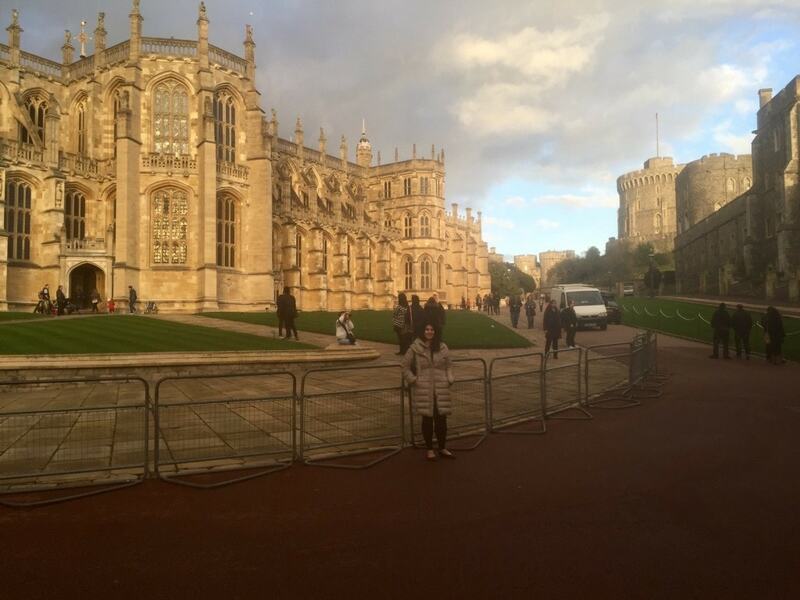 Getting to Windsor Castle is easy, you can take the train from Waterloo station in London. If you prefer there are many tours from London to Windsor Castle to choose from. Buy your ticket in advance to avoid the long line. Windsor Castle is included as part of the London Pass, which can save you money if you are planning to do other sightseeing in London. (Click here for more information on the London Pass). Sign the back of your ticket and have it stamped to get a 1-year Windsor Castle pass. Be sure to pick up audio guide, which is included admission price. Wow it looks fantastic! As a Brit I’m ashamed to say I’ve never been! I’ve added it to my to do list for the summer. Vicky! Yes, you must go, I was very impressed. I wish I would have visited the Windsor Castle last time we were in London. I tried, but my husband didn’t want to do the drive. I think it looks great, inside and outside, and I hope I’ll get to see it someday. Anda – yes it is very impressive, I hope you get to see it too. It is fun to imagine living in Windsor Castle. But for now a visit will have to do. I hope you get to visit soon. More blog posts about London coming up so stay tuned. 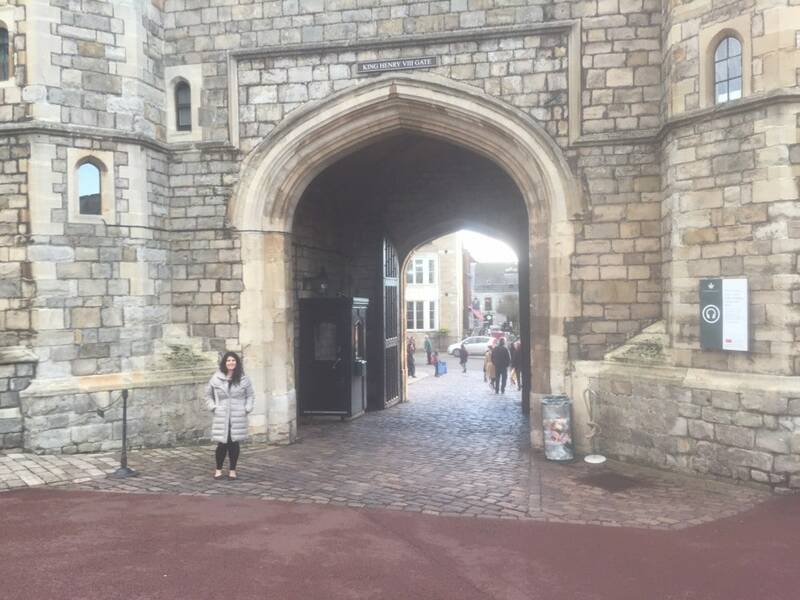 Thanks so much for linking up and reminding me of my (failed) trip to Windsor. Lol! My friends and I drove from London and got there by 4.30pm, and that’s when it shuts! 🙁 I had really really wanted to go there… unfortunately another trip didn’t materialize. The town, however, is so cute and charming! Thanks again for linking up. Hope to see you again next month! Pooja – so sorry to hear that! Hopefully you get to visit again soon. This castle is so lovely. The queen is a lucky lady! At least she shares and lets us commoners have a sneak peak. What a beautiful place!! It’s been on my bucket list. Stephanie – Thank you. This one really is a must see. It is so beautiful and holds so much history. I wish I could have taken pictures inside. Michelle – So much to see in London so it’s understandable. Definitely worth another trip! What a fun day trip! I love that an audio guide comes with the ticket, I always feel like that makes such a big difference! Lena – Yes, I loved Windsor. The audio tour is one of the best I have done and I agree it is so nice it’s included.